The Production Order View and the Resource View in the Manufacturing Module of Microsoft Dynamics NAV Classic Client have been created with the ActiveX Edition of VARCHART XGantt. A wrapper controls the communication between Dynamics NAV and the ActiveX control via an XML interface. The wrapper and the NETRONIC VARCHART XGantt control (vcgantt.ocx) are on the delivery CD of Microsoft Dynamics NAV, Classic Client. The views provides merely contains a fraction of the functionality your Production Schedule could have. A development license of VARCHART XGantt will grant you access to the full functionality of our Gantt chart component. Find instructions also in our Step-by-Step Guide (15 pages), which you can download here. Beside the existing Production Order und Resource View in the Classic Client of Microsoft Dynamics NAV you can also develop new planning boards. For example create individual layouts for the planning of e.g. your delievery dates and the corresponding customers, by visualizing data taken from the table "Sales Header" in a Gantt chart. Red triangles indicate the delivery date. By dragging the triangles delivery dates can be rescheduled. For this example a prototype can be made available on demand. This is only a short example of an overview that makes your production planning in Microsoft Dynamics NAV Classic Client more comfortable and safe. 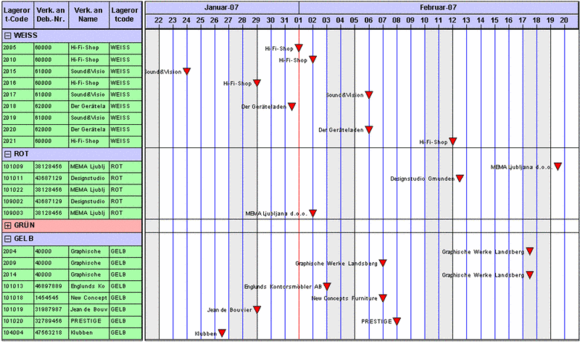 Develop with VARCHART XGantt (ActiveX or .NET) Gantt charts tailored to your special requirements. Download a free trial version of VARCHART XGantt. Our support will guide you how to embed the new Gantt chart to Microsoft Dynamics NAV. You are missing a Production Schedule in the NAV RTC clients? Learn about our Visual Production Scheduler!